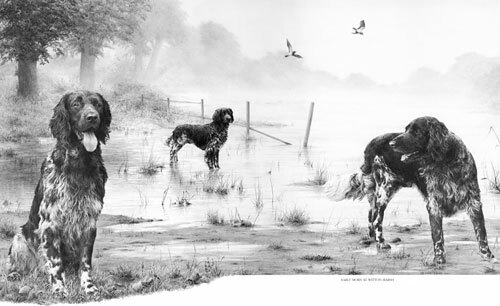 Just a very quick question, I am thinking of taking my drawings a bit more serious to supplement my wildlife oil paintings, so I have been reading both yours and JD Hillberry’s books, websites etc so I don’t make too many novice mistakes, and I wondered why you don’t appear to have gone down the same road as JD, regarding using charcoal pencils to get the non-reflective, VERY darks that seem impossible with standard soft graphite. First, JD and I work in completely different ways. JD’s work is more planned and controlled, such as using frisket to blank out selected areas. That requires a very accurate initial drawing that probably cannot be readily altered during the drawing process. However, I love working in graphite because it offers that direct mind-to-hand-to-paper connection – you think, you draw. So I begin with a very loose set of guidelines (except where accuracy is vital) and I constantly alter or even ignore them as I draw each section. I also begin top left and work down to the bottom right-hand corner (as a generalisation). Nothing is blanked out. The entire image is drawn including the background, tape, and string. When I first began drawing seriously I did use carbon pencils for a while (never charcoal) to achieve more intense blacks. But they always looked false because they lacked the sheen of graphite. At some point I realised I had to be a graphite purist in order for my work to have the unity I wanted, and to allow the mind-to-paper flow that I so enjoy. I also found ways around the problem of weak darks – which isn’t a problem where prints are concerned because they can be corrected. 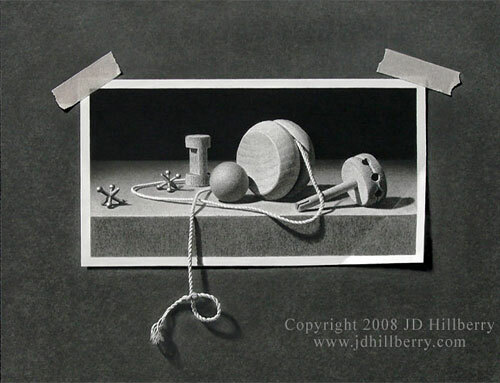 If I need very intense blacks, I complete the drawing and spray with a matt fixative – that allows me to add further layers of soft grade graphite, and I can repeat that process as many times as required. In more general use, I found that 2B would give reasonable blacks (if applied with pressure – and my Mellotex paper can withstand a lot of punishment) but I could increase the intensity by layering with a harder grade – usually HB over 2B. The harder grade breaks up and smooths the courser grains of the soft graphite and fills the tooth that the softer grade left exposed. I also discarded all grades softer than 2B, because they are too grainy and leave a lot of tooth exposed (tiny white pits that visually dilute the intended dark value). Finally, spraying a graphite drawing on completion with a matt fixative removes much of the sheen. With the reflective surface dulled, blacks increase in intensity, three-dimensional form becomes more solid, and the drawing has more visual impact. With practice, I draw in the knowledge that the value I’m creating will later darken and increase in intensity. Our new DRAWING FORUM : www.TheDrawingForum.com – everyone is welcome and it’s Free! Drawn using graphite pencils only.